Attract new leads and win repeat business. It's Expo Season! 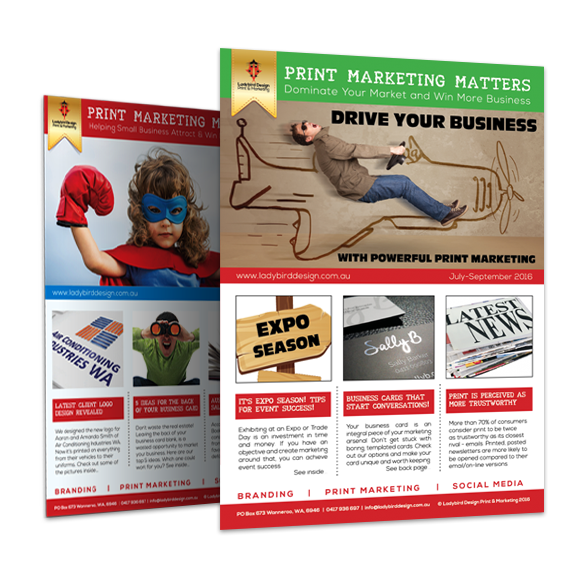 In this edition of "Print Marketing Matters:"
We give you our TOP TIPS for Expo success! Are you listing your business on free online review websites? We showcase some of our clients along with the latest print marketing we have created to help grow their businesses. ^ Free delivery to Australian addresses only. Print Marketing Matters is a quarterly design and marketing newsletter initiated by Ladybird Design, Print & Marketing in Perth, Western Australia. Our mission is to inspire, educate and help businesses and professionals to achieve powerful results using print marketing strategies. Copyright © 2017 Ladybird Design Print & Marketing | All Right Reserved.